I was sitting in my truck minding my own business, waiting for friends, Jeanne and Phil to come out of the salvage store. A large flying insect hovered about my open window. I waved it away; I didn't want a giant grasshopper in the cab. It flew up against windows of the building I was parked next to, flittered up and down, trying to find a way to the open sky in the reflection. It soon gave up and flew back towards me; I waved it away again. It turned away heading to the front of my vehicle, where it plopped itself down on the hood. 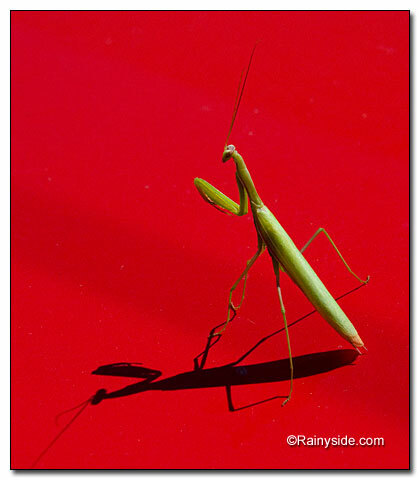 A praying mantis! I grabbed my camera, stealthily crept up on it, and happily snapped the shutter. I went closer and closer; snap, snap went the camera while the long green insect sat perfectly still, contrasting brilliantly against the bright red paint. Occasionally, it wiggled a leg and when I moved behind him for a final photograph, he turned his head and followed my movements. Life sometimes hands you precious moments you keep forever.